The world is a dangerous place. The opposing ideas cause our species to fight and squabble about almost anything. Every so often, those differences seem to disappear, and we cheer for the triumph of the athlete. Today I did some woodworking, but I also watched the winter Olympics in Vancouver. I cheered for the USA. I watched the medal count and felt overwhelming pride with each Bronze, Silver and Gold. But I also cheer at the joy. The pure happiness displayed at a life’s dream achieved. Much has been made of Canada never winning gold at any of the Olympics held on their own soil. The added pressure was evident when with only one skier to go, the Canada’s Jennifer Heil, leading women’s mogul event, had her dream, and that of an entire country, dashed. The tears streaking down her chin were heartbreaking. Today, Alexander Bilodeau put on his skis, trying to do what Jennifer Heil had almost done. Alexander Bilodeau won the gold medal in the men’s moguls’ event, and a nation cheered. I cheered too. The dedication that each man and woman displays, the desire for greatness, is so apparent, is so beautiful, that for a couple of weeks we are inspired to try harder. With this in mind, I rethought how I would cut the 4×4s. I had planned on firing up the Bosch circular saw, as I was sure that they must be too big for the Japanese hand saw. As I looked at the wood, it’s mass, so much greater than the normal 1 inch boards I work with, I had a thought it must be too big. The Japanese don’t use power tools, so they must cut their 4×4’s by hand. It must be possible. But is it incredibly hard, will I screw up my router table legs? In the spirit of the great Olympians fighting it out in Vancouver, I decided to go for it. I marked each leg, just as I would for the circular saw, and then clamped the first one in my vice. I started the cut and with a handful of careful strokes, got the blade heading through the 4×4 on a straight path. To my surprise, the saw easily made the cut. It went so quickly and was so straight that I had to stop and take a picture. The picture set up took longer than it took to cut both the legs. It should be noted that I can’t fit an eight foot 4×4 in my car, so I have the man at the lumber yard cut off a bit. I always make sure to know exactly how long I want my pieces before I go, so that the first two legs are done for me. Cutting the legs was fun. When I was finished, they were all the same length. So I learned that my Japanese hand saws are even more capable than I had previously thought. The next step is to get them sanded up. The rest of the afternoon was spent sanding, watching the Olympics, and taking a Sunday afternoon nap. Not a bad day at all. I am still inspired. And it is a lot harder to slice your finger with a hand saw (not impossible, but a lot harder)! Maybe napping should be an Olympic sport – I practiced today. if you can find one (LOL) ! to bribe them with ? The Ryoba is very thin kerf and as sharp as a hot damn. 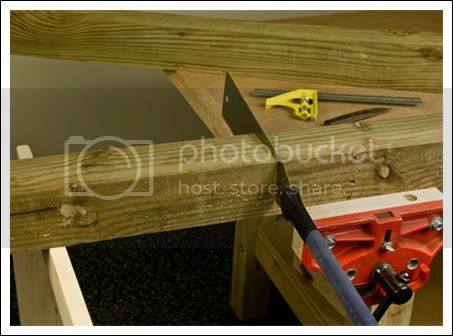 Many times it’s quicker to just pick up a hand tool than to set up a power tool. You have more control and less stress. BTW, your photography is really good. Brian, I have to agree with David in that often it takes more time to get out our power tools than it would take to do a job by hand. This is a nice saw that does cut well. I use mine for all the hand cuts that I do. I agree with all those who comment on the merits of a good hand saw. However, I will also caution you that hand saws can be dangerous also. The biggest scar on my body came from a handsaw that slipped. I’ve never drawn blood with any of my power tools, but just last week I got a nasty cut on the tip of my little finger with a hand plane – gotta keep those fingers off of the sole! Scary sharp chisels can be dangerous too. I’ve got to second (or third) what Rich and 8iowa said. I have cut myself more than once on my Japanese double edged saws. I have an excuse though! It was caused by carelessness and a little stupidity. It wouldn’t be difficult to cut off a finger with one of those if the wrong moves were made. You know, I’ll wish I could re-write my comment. All who commented later were absolutely correct. The only time I have drawn blood on a tool was a hand tool. I was thinking more of the serious injury (losing digits or limbs) when I was thinking of power tool risk. Anyway, you have a nice saw Brian. You reminded me of the first time I ever cut a 4X4. It was daunting! The saw obviously provided a very nice cut. Just curious, how many 4 by 4s can a saw like that be expected to cut before it feels like it needs to be resharpened (and is that a big deal)? I don’t know at all. It was the first saw I purchased. I have used it a lot and there doesn’t seem to be any drop off yet. I only spent $24.00 on it, so I will likely replace it, as opposed to sharpening it.